Roger’s sponsors into Masonry and in to Meridian Lodge were George Patterson and Alf. Lane. Roger was Initiated on October 15, 1958, He was passed to the 2nd degree on November 19, 1958 and Raised on December 17, 1958. Roger was Installed as Worshipful Master of Meridian Lodge on January 8, 1969. 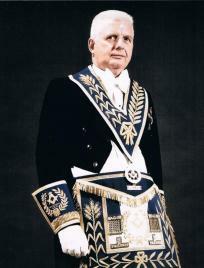 Roger was elected District Deputy Grand Master of Hamilton Masonic District ‘C’ in July, 1977. Roger was the 1st District Deputy Grand Master from Meridian Lodge.